As passionate foodies, Fancy Pantry is very excited to be offering hands on classes to teach techniques, impart knowledge, inspire and get you creating. WHEN: Tuesday nights from 6.30pm to 9.30pm. All classes are followed by a meal; an opportunity to sample your creations. Please feel free to bring along champagne, wine or beer to enjoy with your meal. The great Aussie barbie personifies the relaxed and casual lifestyle of contemporary Australia. From backyard to balcony to picnic destination, barbecuing is a ritual and so much a part of the Australian culture we assume the art comes naturally. As cooks of cremated steak will testify, however, it’s never too late to take up an opportunity to refine your barbecuing skills. Discover how to cook your old favourites in new ways and experiment with some new ideas. Refreshing salads, seafood, the aroma of barbequed meats, beautiful stone fruits and summer berries, iced desserts; now that’s summer. Whether it’s outdoor entertaining or the mid week meal, you’ll be loving these great, simple summer treats. Tempting Tapas and rustic Racione, the history and tradition behind Spanish food is so family and locality orientated, it’s hard not to fall in love with it. Get your paella pan fired up for our banquet of sensational flavours, but make sure you save room for ‘dulces’. 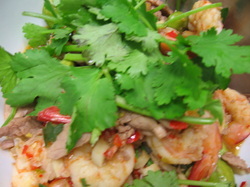 Thai Cuisine is well-known for its balance of five fundamental flavours in each dish or the overall meal - hot (spicy), sour, sweet, salty, and bitter. Use this knowledge to create a range of dishes maximising this amazing taste sensation, whilst utilising quality fresh produce, including seafood. It’s time to show off the fine china and invite your friends for a moment of decadence. We’ll be making all the traditional High Tea must haves, talking about brewing tea and then sitting down to enjoy a selection of beautiful treats. From cupcakes, sandwiches and cakes, to pastries, flans and tarts, come and enjoy this wonderful revival of a great tradition.